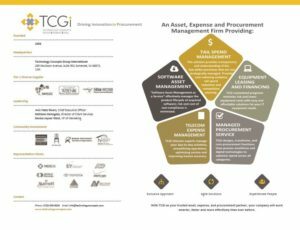 Over the last 30 years, TCGi and its predecessor and affiliated companies have always sought unique, forward-thinking solutions and ways to deliver critical IT services to its customers. During this time we created custom-tailored programs based on a customer’s present and future needs. In doing so, we established strong, strategic, long-term relationships with a long roster of corporations all across the country. We created client-specific asset recovery programs for companies such as PSEG, Merrill Lynch®, DuPont® and Disney. Each one addressed unique circumstances and goals, streamlining their practices of end-of-life management of IT (and other) assets. Working closely with Verizon Business Services, TCGi launched–and managed for 14 years–a point-of-sale Sportsmen Licensing Application for the NY Department of Conservation/Fish & Game Division. Acquiring a spin off, and with expertise from Bank of America, TCGi expanded into the technology lease and finance arena. This step would prove to be very beneficial when the need to create Integrated IT Procurement arose at Merck. All three highlight how the TCGi Team is uniquely qualified and proven experts in our field. We‘re thoroughly process oriented, taking all the time necessary to fully review, understand and analyze current customer issues with an eye on their future goals and objectives. Only then, do we devise a comprehensive solution that provides desired results and complete satisfaction. By streamlining our processes TCGi helps our customers drive down the costs of IT operations and empowers them to focus on their core business. It’s a partnership that lets them do what they do best while we take care of the rest.